Village Terraces is a neighborhood within Earthaven Ecovillage. Our vision is to create extended family and a deep connectedness to the earth, ourselves, and each other. 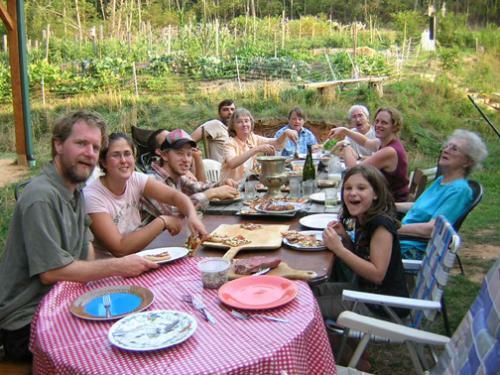 As the first cohousing group at Earthaven, we are building and living densely in order to share resources, including extensive common space, facilities, and utilities. Of our envisioned four buildings we have built two, which house about twenty residents, including children. We will eventually share the neighborhood with 24 to 30 adults plus children. The cohousing style provides “apartments” that can include private kitchenettes and baths, with the added benefit of shared common spaces such as a large common kitchen and bath, common gardens, orchards, and a pasture for dairy animals. We also have access to Earthaven’s Council Hall and other community facilities, as well as shared use of most of Earthaven’s 329 acres. Our legal entity is a housing cooperative. •	A desire to raise children together in a neighborhood and village context. •	Honest and responsible communication with an active willingness to resolve conflicts in a healthy manner. •	A commitment to consciously and lovingly raising both plants and animals for food. •	Love and acceptance of ourselves, our bodies, and the cycles of life and death. •	Cooperative living in common-walled buildings built with local materials. To learn more about the process of joining Village Terraces, read our Initial Contact Letter on our website. Joining Village Terraces Neighborhood means being a part of Earthaven Ecovillage. Please explore the village through our website, a tour, and extended visits. Earthaven.org is full of detailed info on Earthaven Ecovillage and Village Terraces describes our neighborhood in specific. This shows photos of our wonderful home gardens.